What does an Irish father of quadruplets who has died three times on the operating table have to lose? Nothing. And this is why Chopped Champion Chef Matt Murphy of The Irish House, upon returning to life from a three-month coma, opened New Orleans' most authentic Irish restaurant and bar. “Having gone through what I did with the necrotizing fasciitis, I realized that if I died, there would be no one to teach my kids about Irish traditions and culture,” Murphy says. The chef, now the father of fi ve little girls, also explains that opening the Irish House in the city of New Orleans made perfect sense, considering so many Irish immigrants are responsible for building the city. “You hear about how New Orleans is a French or Spanish city, when in reality, the city was built by the Irish. Why else would there be a statue on West End for the 18,000 Irish men who lost their lives building the canal?” This is truth. And expect nothing less from a man who confesses to being slightly diffi cult to work for. It is his expectation for greatness and persistent encouragement of his employees to produce quality food that has resulted in accolades glorifying his establishment as the only traditional Irish restaurant in town. The menu is a combination of New Orleans ingredients and foods people use in Ireland. Their soups, particularly the potato and leek soup, are all made in-house and sell extremely well. Bubble and Squeak, an authentic Irish meal, is done during brunch service omelet-style, and consists of Irish pork, spinach, shaved cabbage, onions, butter-sauteed crushed potatoes, and chives. 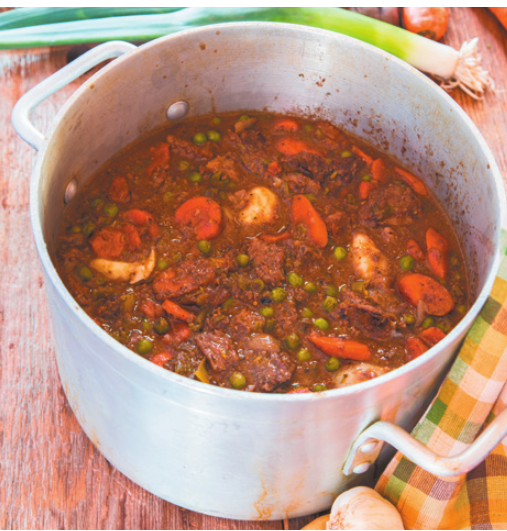 One of Chef Murphy's favorite dishes, the Lamb Shank, is served with rice alongside Covey Rise Farms vegetables. The kitchen of well-versed cooks exercises its allergy-sensitive expertise in the form of an entire gluten-free menu, which hosts a bounty of fl avors and selections. Chef de Cuisine Justin presented a rather beautiful dish of perfectly pan-seared scallops over caulifl ower in a wellseasoned cream sauce with a sprinkle of pecans for my gluten-free sampling. It was delicious. Bartenders Hayden and Jeb took turns properly pouring the loveliest Guinness stouts, [which is] “a requirement if you're going to work here,” announces Chef Murphy. The food isn't all the patrons at the Irish House are interested in. The infamous wall of whiskey bears rare Irish gems, some for taste and sale, others for private consumption. Either way, you'll probably never see this many Irish whiskeys in one bar outside of Ireland. The entertainment is no less authentic, as management handpicks Irish talent for performances. “We have the Irish Rhymers over the Christmas holidays,” says the chef, pointing out that the dancers perform traditional Irish jigs, and the bands play verifi ably rooted music. If that isn't enough to grab you, the framed memorabilia, whether familial or personally unrelated, include some of Chef Murphy's most cherished possessions. From his Irish stamp collection, to the photos of his mother and father, to the 1800s Irish famine newspaper encased in wood and glass, these things make the place what it truly is. Where it is proper conduct to imbibe Irish libations and enjoy bona fi de cuisine and entertainment, American traditions during St. Patrick’s Day include festive moderations like green beer and heavily spiked Jell-O shots, among other locally infl uenced parade carousing. J.B.'s off Metairie Road is an incredibly convenient bar to celebrate on the parade route. Known for its green Jell-O shots, holidayappropriate drink specials, and green beers, there is ample parking around the location and enough space inside the bar to entertain a dance fl oor or a pyramid stand of party pics. The crowd is generally young and fun-loving, particularly on parade day. Service is fast, and although it isn't classifi ed as an Irish pub, J.B.'s throws a St. Patty's party like no other. Tracey's—the original Irish Channel Bar on Magazine and Third—has been a neighborhood landmark since 1949. This Irish pub with a sports bar atmosphere offers more of a New Orleans-infl uenced menu, while the bar stocks a veritable playground of Irish beers and liquors. Tracey's has been noted as having the best roast beef po-boy around. A great place to catch a football game or other sports event, Tracey's is often fi lled to the brim with locals and friendly neighborhood regulars. Parasol's is an Irish Channel pub considered a NOLA institution by its clientele. Founded in 1952, then-owner Louis Passauer was afraid people would be unable to pronounce his last name, hence the name Parasol's. 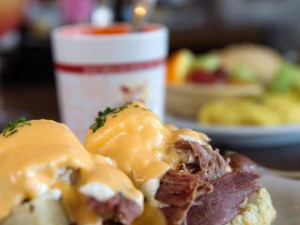 Just like Tracey's, Parasol's is also noted as the home of the best roast beef po-boy, and its habitual foodies claim that the kitchen cranks out the tastiest homemade onion rings around. The laid-back atmosphere attracts locals and tourists alike, and St. Patrick's Day events draw a thick and diverse crowd. The pub holds an enormous block party during St. Patrick's Day celebrating Irish heritage. Marking the recent passing of owner John Hogan, this year's St. Patrick's Day festivities will honor Hogan and his spirit with joyful remembrance. The story of Finn McCool's begins in Belfast, Ireland, coming to New Orleans in the 1990s. Surviving and then rebuilding after Hurricane Katrina, the Irish pub reopened on St. Patrick's Day in 2006. Ever since, the Mid-City community favorite packs a full house. The grub comes from Boo Koo BBQ, which serves up wings, fried pickles, and your standard pub bites, and then items like the Cajun Banh Mi—a Vietnamese sandwich with pulled pork, boudin and hogshead cheese— and the burgers, all named after Irish cities and pairing things like fried eggs and slaw, make the ordinary extraordinary. Apart from the food and booze that can be found all along the parade route, St. Patrick's Day in New Orleans is unlike anywhere else. A menagerie of fl oats and jazz band processions take the stage, while costumed partygoers gather as they would for Carnival to catch strings of beads, novelty throws, cabbages, potatoes, and carrots. Chef Matt Murphy offers ideas on recipes you can create at home with your parade catches. He is fond of soups and stews, and recommends using cabbage to make your own vegetable stock at home. One of his personally used recipes is a sandwich coleslaw like the one they use at the Irish House. Combine your thinly shaved cabbage and carrots with a small amount of vinegar, and coat with mayonnaise. Depending on the size and amount of cabbage and carrots, adjust the fl avor to suit your tastes. Another traditional Irish dish is Bubble and Squeak. The historic staple gets its name from the sounds the ingredients make while cooking. The onion and potatoes boil and bubble, while the cabbage squeaks on the side of the pot. There are many variations to this, as various and sundry vegetables can be added (not to mention sauces), or you can prepare it as you would a pancake in the recipe below. Heat the butter in a large skillet, and fry the onion over low heat for 5 minutes until softened. Add cabbage and stir over low heat for 2 minutes. Fold in the mashed potatoes until well blended with the cabbage. Press mixture lightly onto the surface of the skillet to form a large pancake. Cook for 5 minutes until the underside has browned lightly. Turn and brown on the second side for 5 minutes. Makes 4 servings. Without a doubt, New Orleans can match the uniquely Irish sense of fun and love of genuinely unparalleled food, and meanwhile express our gratitude for the immigrant Irish men and women that made our city what it is today. Erin Go Bragh and happy Saint Patrick's Day!